Middlesbrough held off a laudable late fightback from League Two Chesterfield to reach round two of the Carling Cup. Scott McDonald slid into the corner on the back of a fine counter-attack to hand the Championship side the lead, before Julio Arca slammed in for 2-0. The Spireites kept pressing, though, and were rewarded when Dwayne Mattis headed in Danny Whitaker's fine cross. It prompted a fine spell for the hosts, but Jack Lester saw Chesterfield's best chance saved by Jason Steele late on. "In the first half we gave them to much respect and treated it like a pre-season game instead of a cup tie. "They're a very good passing side, they moved the ball around well and made it difficult. "We switched off at times and go punished with two goals." 93:39 The referee starts the match. 90:00+2:50 Attacking throw-in by Scott Griffiths (Chesterfield). 90:00+2:42 Defending throw-in by Scott Griffiths (Chesterfield). 89:41 Header by Ian Breckin (Chesterfield) from centre of penalty area (12 yards), over the bar. Goal kick taken long by Jason Steele (Middlesbrough). 89:41 Substitution Middlesbrough substitution: Luke Williams replaced by Lee Miller (tactical). 89:25 Shot by Jack Lester (Chesterfield) right-footed from right channel (25 yards), save (tipped over) by Jason Steele (Middlesbrough). 88:42 Defending throw-in by Jack Hunt (Chesterfield). 88:04 Cross by Drew Talbot (Chesterfield), shot by Scott Griffiths (Chesterfield) right-footed from centre of penalty area (18 yards), missed right. Goal kick taken long by Jason Steele (Middlesbrough). 86:48 Foul by Derek Niven (Chesterfield) on Josh Walker (Middlesbrough). Direct free kick taken right-footed by Julio Arca (Middlesbrough) from own half, cross by Justin Hoyte (Middlesbrough), clearance by Ian Breckin (Chesterfield). Correction - 86:48 Foul by Derek Niven (Chesterfield) on Josh Walker (Middlesbrough). Direct free kick taken right-footed by Julio Arca (Middlesbrough) from own half, passed. Cross by Justin Hoyte (Middlesbrough), clearance by Ian Breckin (Chesterfield). 85:43 Defending throw-in by Justin Hoyte (Middlesbrough). 85:28 Attacking throw-in by Jack Hunt (Chesterfield). 84:45 Shot by Danny Whitaker (Chesterfield) right-footed from left channel (18 yards), missed right. Goal kick taken long by Jason Steele (Middlesbrough). 84:03 Cross by Scott McDonald (Middlesbrough), resulting in ball out of play. Goal kick taken long by Tommy Lee (Chesterfield). 83:46 Attacking throw-in by Justin Hoyte (Middlesbrough). 82:54 Jack Lester (Chesterfield) caught offside. Indirect free kick taken right-footed by Jason Steele (Middlesbrough) from own half, resulting in open play. 79:56 Shot by Justin Hoyte (Middlesbrough) right-footed from right channel (20 yards), resulting in open play. Shot by Luke Williams (Middlesbrough) right-footed from right channel (25 yards), blocked by Jack Hunt (Chesterfield). Pass corner from left by-line taken by Josh Walker (Middlesbrough) to short, resulting in ball out of play. Goal kick taken long by Tommy Lee (Chesterfield). Shot by Leroy Lita (Middlesbrough) right-footed from right channel (18 yards), save (blocked) by Tommy Lee (Chesterfield). 78:58 Goal kick taken long by Tommy Lee (Chesterfield). 77:19 Defending throw-in by Justin Hoyte (Middlesbrough). 75:54 Cross by Drew Talbot (Chesterfield), resulting in ball out of play. Goal kick taken long by Jason Steele (Middlesbrough). 75:40 Attacking throw-in by Drew Talbot (Chesterfield). 75:35 Goal kick taken long by Tommy Lee (Chesterfield). 74:22 Substitution Middlesbrough substitution: Jonathan Grounds replaced by Seb Hines (tactical). 74:15 Attacking throw-in by Scott Griffiths (Chesterfield). 73:27 Foul by Jonathan Grounds (Middlesbrough) on Jack Lester (Chesterfield). Free kick crossed right-footed by Danny Whitaker (Chesterfield) from left channel, clearance by Leroy Lita (Middlesbrough). 73:05 Cross by Drew Talbot (Chesterfield), header by Derek Niven (Chesterfield) from centre of penalty area (12 yards), save (caught) by Jason Steele (Middlesbrough). 72:12 Foul by Jack Lester (Chesterfield) on Joe Bennett (Middlesbrough). Direct free kick taken right-footed by Joe Bennett (Middlesbrough) from left channel, resulting in open play. 71:13 Foul by Derek Niven (Chesterfield) on Scott McDonald (Middlesbrough). Direct free kick taken left-footed by Joe Bennett (Middlesbrough) from own half, resulting in open play. 70:48 Outswinging corner from right by-line taken right-footed by Danny Whitaker (Chesterfield) to centre, clearance by David Wheater (Middlesbrough). 70:23 Goal kick taken long by Jason Steele (Middlesbrough). 70:08 Shot by Dwayne Mattis (Chesterfield) right-footed from right channel (20 yards), missed left. 69:39 Goal kick taken long by Tommy Lee (Chesterfield). 69:32 Shot by Nicky Bailey (Middlesbrough) right-footed from right channel (30 yards), missed left. 67:43 Assist (cross) by Danny Whitaker (Chesterfield) from left channel. 67:43 GOAL - Dwayne Mattis:Chesterfield 1 - 2 Middlesbrough headed goal by Dwayne Mattis (Chesterfield) (top-right of goal) from centre of penalty area (18 yards).Chesterfield 1-2 Middlesbrough. 67:11 Cross by Luke Williams (Middlesbrough), resulting in open play. 66:12 Attacking throw-in by Joe Bennett (Middlesbrough). 63:26 Cross by Drew Talbot (Chesterfield), resulting in open play. Corner from right by-line taken short right-footed by Danny Whitaker (Chesterfield). 61:47 Shot by Derek Niven (Chesterfield) right-footed from right channel (25 yards), blocked by David Wheater (Middlesbrough). 61:47 Booking Jonathan Grounds (Middlesbrough) booked for unsporting behaviour. 59:55 Leroy Lita (Middlesbrough) caught offside. Direct free kick taken right-footed by Tommy Lee (Chesterfield) from own half, resulting in open play. 59:02 Booking Derek Niven (Chesterfield) booked for unsporting behaviour. 59:02 Foul by Derek Niven (Chesterfield) on Luke Williams (Middlesbrough). Direct free kick taken left-footed by Josh Walker (Middlesbrough) from left channel, passed. 58:17 Attacking throw-in by Scott Griffiths (Chesterfield). 57:28 Substitution Chesterfield substitution: Robert Page replaced by Derek Niven (tactical). 57:28 Attacking throw-in by Joe Bennett (Middlesbrough). 54:18 Shot by Scott McDonald (Middlesbrough) right-footed from right channel (30 yards), over the bar. Goal kick taken long by Tommy Lee (Chesterfield). 53:12 Foul by Julio Arca (Middlesbrough) on Jack Hunt (Chesterfield). Free kick crossed right-footed by Jack Hunt (Chesterfield) from right wing, resulting in open play. 52:29 Cross by Jack Hunt (Chesterfield), clearance by Jonathan Grounds (Middlesbrough). Throw-in by Ian Breckin (Chesterfield). Correction - 52:29 Cross by Jack Hunt (Chesterfield), clearance by Jonathan Grounds (Middlesbrough). Attacking throw-in by Ian Breckin (Chesterfield). 50:36 Throw-in by Scott Griffiths (Chesterfield). Correction - 50:36 Defending throw-in by Scott Griffiths (Chesterfield). 49:23 Cross by Justin Hoyte (Middlesbrough), clearance by Ian Breckin (Chesterfield). Cross by Josh Walker (Middlesbrough), shot by Justin Hoyte (Middlesbrough) mishit left-footed from centre of penalty area (12 yards), missed right. Goal kick taken long by Tommy Lee (Chesterfield). 48:21 Attacking throw-in by Joe Bennett (Middlesbrough). 47:38 Defending throw-in by Scott Griffiths (Chesterfield). 47:15 Defending throw-in by Joe Bennett (Middlesbrough). 46:49 Shot by Luke Williams (Middlesbrough) right-footed from right channel (18 yards), save (caught) by Tommy Lee (Chesterfield). 46:14 Attacking throw-in by Scott Griffiths (Chesterfield). 45:47 Defending throw-in by Justin Hoyte (Middlesbrough). 45:08 Defending throw-in by Justin Hoyte (Middlesbrough). 45:00+1:52 Shot by Scott McDonald (Middlesbrough) right-footed from left channel (30 yards), save (caught) by Tommy Lee (Chesterfield). 45:00+1:38 Attacking throw-in by Scott Griffiths (Chesterfield). 45:00+1:20 Goal kick taken long by Tommy Lee (Chesterfield). 45:00+1:07 Shot by Josh Walker (Middlesbrough) left-footed from right channel (25 yards), over the bar. 45:00+0:29 Attacking throw-in by Scott Griffiths (Chesterfield). 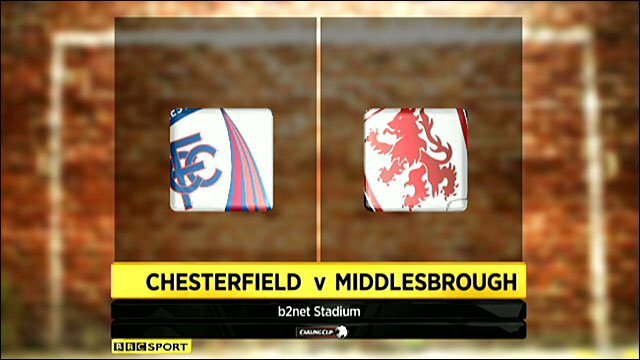 45:00+0:10 Cross by Leroy Lita (Middlesbrough), blocked by Robert Page (Chesterfield). 43:48 Attacking throw-in by Joe Bennett (Middlesbrough). 41:28 Foul by David Wheater (Middlesbrough) on Jack Lester (Chesterfield). Direct free kick taken right-footed by Jack Lester (Chesterfield) from right channel, shot by Drew Talbot (Chesterfield) right-footed from right channel (30 yards), missed right. Goal kick taken long by Jason Steele (Middlesbrough). 40:43 Attacking throw-in by Scott Griffiths (Chesterfield). 39:26 Cross by Ian Breckin (Chesterfield), blocked by Joe Bennett (Middlesbrough). Corner from right by-line taken short right-footed by Danny Whitaker (Chesterfield). Cross by Jack Hunt (Chesterfield), clearance by David Wheater (Middlesbrough). 38:58 Justin Hoyte (Middlesbrough) caught offside. Indirect free kick taken right-footed by Danny Whitaker (Chesterfield) from own half, resulting in open play. 36:41 Cross by Scott Griffiths (Chesterfield), clearance by Julio Arca (Middlesbrough). Attacking throw-in by Scott Griffiths (Chesterfield).Cross by Mark Allott (Chesterfield), header by Jack Lester (Chesterfield) from right side of six-yard box (6 yards), save (tipped over) by Jason Steele (Middlesbrough). Outswinging corner from right by-line taken right-footed by Danny Whitaker (Chesterfield) to centre, header by Drew Talbot (Chesterfield) from left side of six-yard box (6 yards), missed left. Goal kick taken long by Jason Steele (Middlesbrough). 35:31 Attacking throw-in by Scott Griffiths (Chesterfield). 34:16 Shot by Leroy Lita (Middlesbrough) right-footed from left channel (18 yards), blocked by Simon Ford (Chesterfield). 33:28 Foul by Jack Lester (Chesterfield) on Nicky Bailey (Middlesbrough). Indirect free kick taken right-footed by Jason Steele (Middlesbrough) from own half, resulting in open play. 32:20 Assist (pass) by Josh Walker (Middlesbrough) from own half. 32:20 GOAL - Julio Arca:Chesterfield 0 - 2 Middlesbrough Goal by Julio Arca (Middlesbrough) left-footed (low centre of goal) from left channel (18 yards).Chesterfield 0-2 Middlesbrough. 31:45 Defending throw-in by Joe Bennett (Middlesbrough). 30:51 Shot by Danny Whitaker (Chesterfield) right-footed from left channel (35 yards), over the bar. 30:28 Attacking throw-in by Ian Breckin (Chesterfield). 30:22 Cross by Drew Talbot (Chesterfield), clearance by David Wheater (Middlesbrough). 29:16 Goal kick taken long by Jason Steele (Middlesbrough). 28:52 Shot by Scott McDonald (Middlesbrough) right-footed from left channel (25 yards), over the bar. 28:02 Defending throw-in by Ian Breckin (Chesterfield). 26:55 Jack Lester (Chesterfield) caught offside. Indirect free kick taken right-footed by Jason Steele (Middlesbrough) from own half, resulting in open play. 26:30 Cross by Scott Griffiths (Chesterfield), save (caught) by Jason Steele (Middlesbrough). 25:47 Defending throw-in by Ian Breckin (Chesterfield). 25:30 Cross by Jack Hunt (Chesterfield), shot by Drew Talbot (Chesterfield) right-footed from right channel (20 yards), blocked by David Wheater (Middlesbrough). 24:24 Cross by Julio Arca (Middlesbrough), save (caught) by Tommy Lee (Chesterfield). Correction - 24:03 Cross by Justin Hoyte (Middlesbrough), blocked by Danny Whitaker (Chesterfield). Attacking throw-in by Justin Hoyte (Middlesbrough). 24:03 Cross by Justin Hoyte (Middlesbrough), blocked by Danny Whitaker (Chesterfield). Throw-in by Justin Hoyte (Middlesbrough). 23:55 Cross by Luke Williams (Middlesbrough), clearance by Scott Griffiths (Chesterfield). 23:07 Defending throw-in by Joe Bennett (Middlesbrough). 22:47 Cross by Justin Hoyte (Middlesbrough), save (caught) by Tommy Lee (Chesterfield). 22:10 Defending throw-in by Ian Breckin (Chesterfield). 20:00 Foul by Robert Page (Chesterfield) on Leroy Lita (Middlesbrough). Direct free kick taken right-footed by Josh Walker (Middlesbrough) from left channel, passed. 19:50 Defending throw-in by Joe Bennett (Middlesbrough). 18:30 Foul by David Wheater (Middlesbrough) on Drew Talbot (Chesterfield). Free kick crossed left-footed by Scott Griffiths (Chesterfield) from left channel, resulting in ball out of play. Goal kick taken long by Jason Steele (Middlesbrough). 16:48 Attacking throw-in by Scott Griffiths (Chesterfield). 15:40 Shot by Leroy Lita (Middlesbrough) right-footed from centre of penalty area (18 yards), missed left. Goal kick taken long by Tommy Lee (Chesterfield). 14:29 Goal kick taken long by Tommy Lee (Chesterfield). 13:33 Foul by Mark Allott (Chesterfield) on Julio Arca (Middlesbrough). Direct free kick taken right-footed by Julio Arca (Middlesbrough) from right channel, passed. 12:40 Attacking throw-in by Justin Hoyte (Middlesbrough). 12:34 Goal kick taken long by Tommy Lee (Chesterfield). 11:32 Attacking throw-in by Scott Griffiths (Chesterfield). 7:41 Assist (cross) by Leroy Lita (Middlesbrough) from right channel. 7:41 GOAL - Scott McDonald:Chesterfield 0 - 1 Middlesbrough goal by Scott McDonald (Middlesbrough) right-footed (bottom-left of goal) from right channel (20 yards).Chesterfield 0-1 Middlesbrough. 7:08 Cross by Scott Griffiths (Chesterfield), save (caught) by Jason Steele (Middlesbrough). 5:41 Cross by Leroy Lita (Middlesbrough), clearance by Simon Ford (Chesterfield). Corner from right by-line taken short right-footed by Luke Williams (Middlesbrough). Cross by Josh Walker (Middlesbrough), save (caught) by Tommy Lee (Chesterfield). 3:39 Foul by Mark Allott (Chesterfield) on Julio Arca (Middlesbrough). Direct free kick taken right-footed by Josh Walker (Middlesbrough) from left channel, passed. 3:13 Goal kick taken long by Tommy Lee (Chesterfield). 3:00 Shot by Luke Williams (Middlesbrough) drilled right-footed from right channel (25 yards), missed left. 1:52 Attacking throw-in by Justin Hoyte (Middlesbrough). 1:25 Goal kick taken long by Jason Steele (Middlesbrough). 1:09 Foul by David Wheater (Middlesbrough) on Jack Lester (Chesterfield). Direct free kick taken left-footed by Scott Griffiths (Chesterfield) from left channel, passed. 0:33 Goal kick taken long by Tommy Lee (Chesterfield). 0:14 Attacking throw-in by Joe Bennett (Middlesbrough).